I made this fun Springtime wreath a few years ago after I'd found these old French seed packet labels on Etsy. 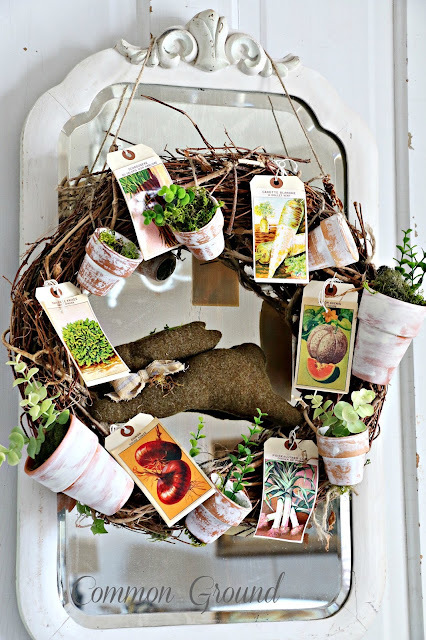 I added them to some tags and then tied whitewashed flowerpots on the grapevine wreath. Last year I didn't get to use it because it was hidden among a ton of other tubs and boxes in the garage, but this year it's hanging on the mirror on the old door in the Kitchen Sitting Area. Adding a felted wool rabbit to the middle made it feel a little more "Easter-y". 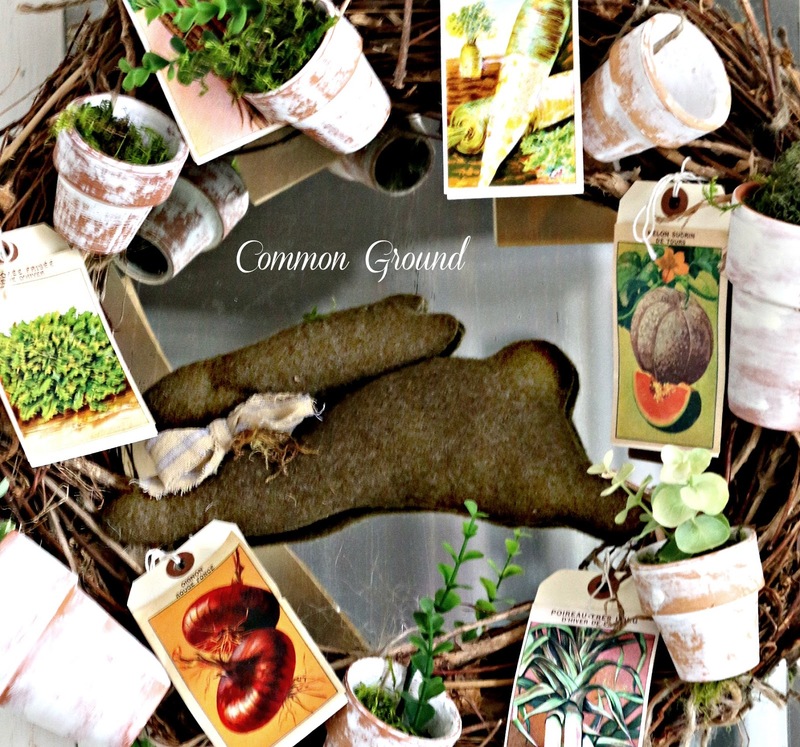 and are filled with moss and bits of faux herbs. and so much fun to decorate for the seasons and holidays. It's always fun to change up this area with different quilts and pillows. I exchanged my red watering can for the Spring Green one. the green can needs a pop of yellow! Love your wreath - it looks so good on your garden area. Thanks so much for sharing. Debra your wreath has to be the most adorable thing I have seen yet this spring! Thank you so much for sharing!!! That is such a cute sitting area! 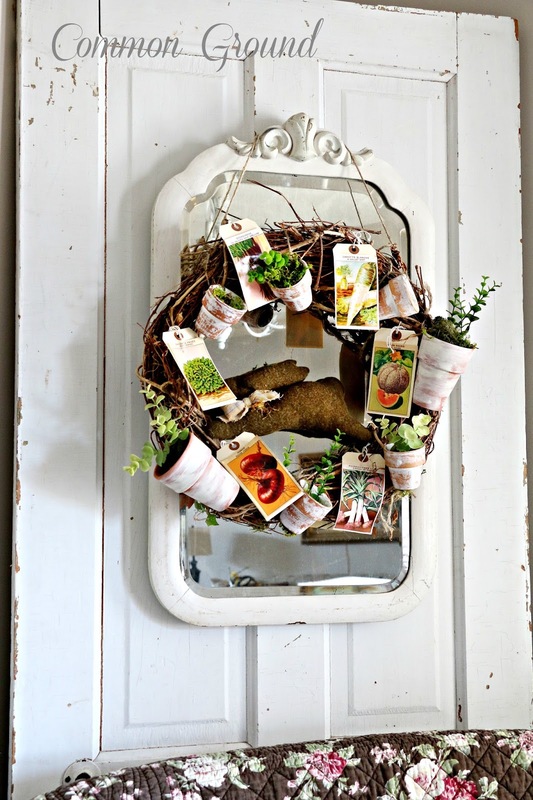 I like the vintage seed packets you used to adorn that wreath. That was a neat idea. Hope you're having a nice Spring so far. Thanks for linking up to the party tonight too! I adore your wreath Debra! Your sitting area is perfectly garden-y and I have watering can envy! Happy Easter! I so enjoy seeing you finding your 'stuff' and playing house again! The added felt bunny is so adorable. He looks real! Ours will be a quiet Easter, but still enjoyable. I hope yours is too. So~o~o glad that you found your Garden Flower Pot Wreath, dear friend! Love the addition of the felted rabbit, just in time for Easter! Your "fur babies" are too, too cute! 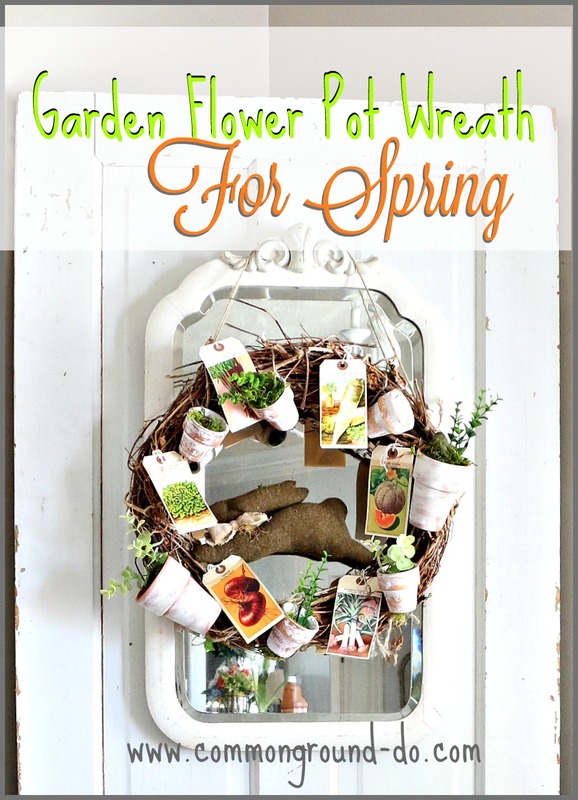 Love this wreath and the whole area is so perfectly Springy! 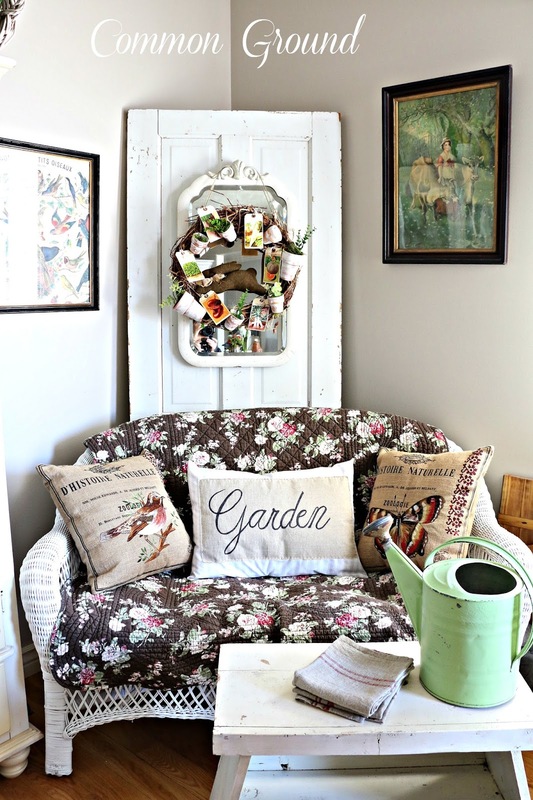 Love that watering can. 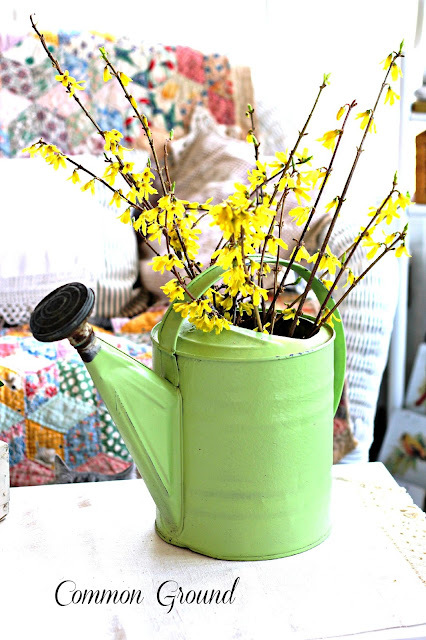 You could get a faux bush of forsythia! Wishing you a very happy and blessed easter, Debra! I love it. I'm so excited spring is here! I love planting flowers. Have a blessed Easter! Love your wreath, very pretty! Cute little pots, and I like the little rabbit. I love your wreath, Debra! You are so creative! Deb, that is just entirely too stinkin' cute! You are so clever and crafty! Hope you are enjoying your springtime - so nice it is finally here! Love, love this wreath! Timeless and sooo charming! Happy Spring, sweetie!! Hope all is well! Will touch base soon!